This Baked Lasagna Recipe is one I came up with decades ago when my daughter wanted to learn how to cook. I had found a baked lasagna recipe geared toward children in the newspaper one Sunday. I decided to change it up a bit to take into consideration the things she liked and to leave out what she didn’t like. It turned out delicious and she was very proud. * I don’t measure but I sprinkle the Italian Seasoning across the top in a thin layer, sprinkle the oregano the same way only half as much, sprinkle a few pinches of basil over that and stir. When the noodles are ready, drain them and let them cool slightly so you don’t get burned when you pick them up. There you have it! 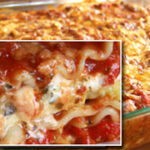 This is a fantastic yet easy Baked Lasagna Recipe for your enjoyment. Here are the nutrition facts on mozzarella and parmesan cheese.